September | 2012 | Follow That Trail! 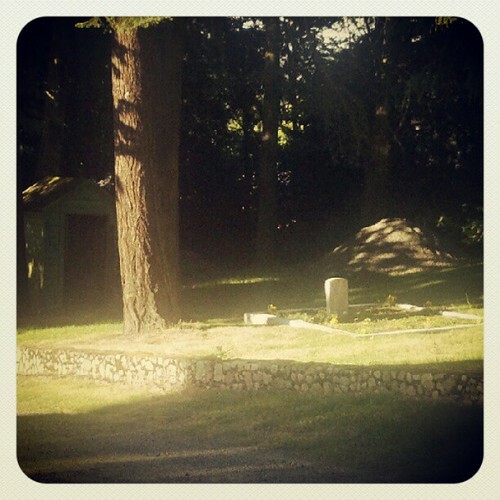 Solitary: In Seattle’s Discovery Park, there is located a small military cemetery. I’ve always been a sucker for cemeteries and the one inside Fort Lawton was no exception. They are full of names, hidden histories and mysteries with answers we could only fabricate in our imaginations. This particular cemetery was the resting place of soldiers from the Second World War and Korean War (or both). The U.S. soldiers were laid out in neat rows, forever resting in the solidarity of their comrades in arms. This is the grave of a German POW, separated by a dirt road and a small stone wall, laid to rest in solitary confinement, far from his home and his loved ones. Fort Lawton was temporarily used to hold German and Italian prisoners of war during WWII and it is believed that Albert Marquardt drank lacquer thinner with the intent of committing suicide. An Italian POW was also killed while imprisoned here, found hung from a wire cable in one of the obstacle courses.